Besides summer tomatoes and basil, my most cherished summer vegetable is that silky, luxurious sweet corn that appears in farmers markets in August. Sweet Silver Queen (grown in the Northeast) corn delivers a mouthful of succulence in each bite. The unusual sweetness occurs because the Silver Queen does not turn the sugar into starch during growth. In one serving of corn on the cob, there are 7.5 grams of carbohydrates and 1.5 grams of protein. The total fat in corn on the cob is 0.8 gram, and there is also 0.8 gram of dietary fiber per serving. Corn on the cob consists mostly of carbohydrates in comparison to fat and protein. There are 44 calories per serving of corn on the cob. When I grew up, there was only one way to make corn. Boil water, add the corn, bring water back to a boil, and cook for 5 minutes. We always ate the corn with our barbecue by brushing it with butter or margarine and sprinkling it with salt. 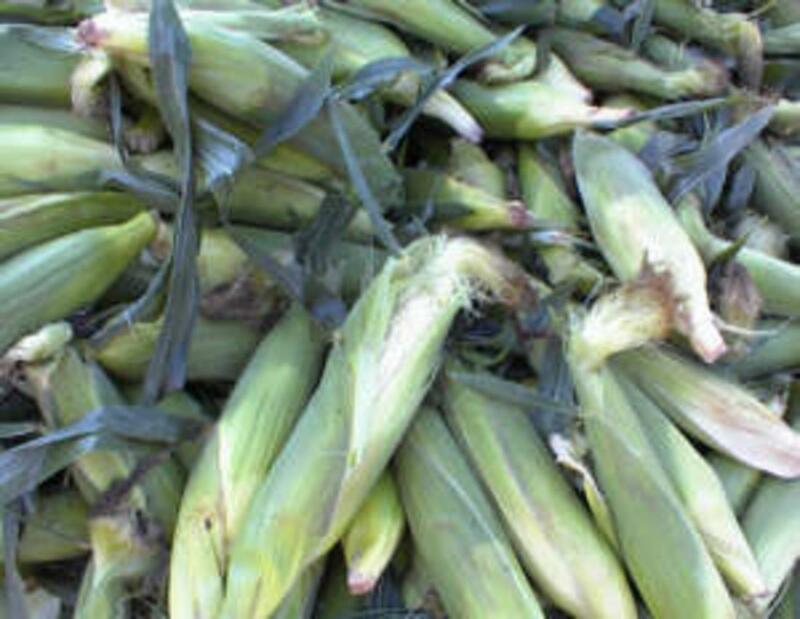 It was corn in its most natural form and as kids, we could never get enough of its delicious sweetness! Lately, I have become a lover of grilled corn. There are so many ways to prepare it. Some recipes for grilling corn on the cob involve grilling it in the husk, inside heavy duty aluminum foil or without the husk on the grill. The primary difference between using the husk or foil and leaving the corn unwrapped has to do with the texture of the corn. Grilling corn on the cob in aluminum foil requires wrapping the corn in the foil and grilling it for approximately 20 minutes on medium heat. Grilling the corn without the husks takes less time, about 10-12 minutes. Basically, you brush the corn with a dressing, such as butter, salt and pepper, and grill, turning it every 2-3 minutes until tender and slightly charred. Below are two variations on grilled corn, one with and one without the husks. I encourage you to experiment with toppings and spices. Parsley, basil and mint make great fresh spices. You can add these after grilling or mix with butter or mayonnaise dressing. I also love rolling the corn in parmesan cheese, when eating with grilled salmon. There are so many ways to grill the corn and each has its own tangy flavor. Of course, you can enjoy the corn, just by boiling it, as my mom did! Pull back husks of corn, being careful to leave husks attached at bottom of each ear. Remove and discard corn silk. Rinse corn. Combine margarine, mustard, garlic and seasonings. Spread about 1 Tbsp. of the mustard mixture onto each ear of corn. Rewrap husks around corn. Grill 15 to 20 min. or until corn is tender, turning frequently to prevent husks from burning. Serve warm. Pull off husks off corn and rinse. Combine remaining ingredients. Brush about 1 Tbsp. of the mixture onto each ear of corn. Grill 10 minutes, turning every 3-4 minutes until corn is tender and slightly charred. Serve warm.